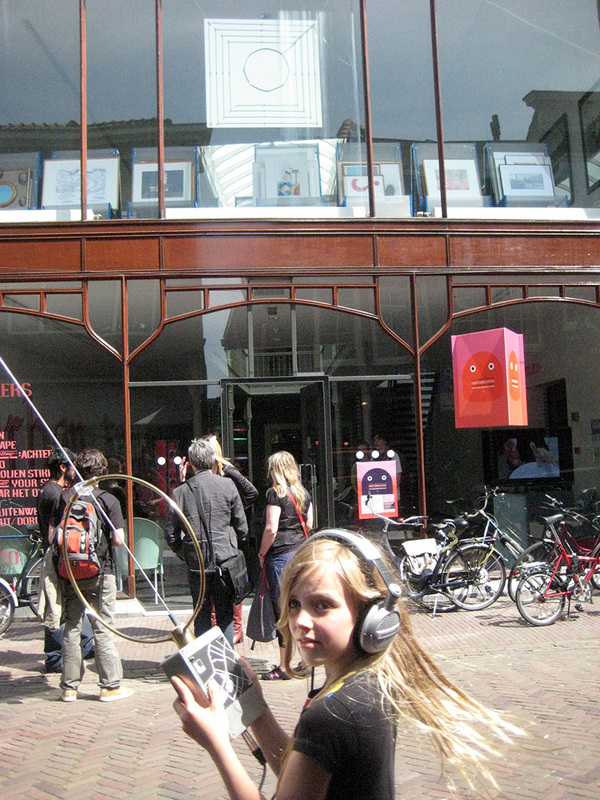 Radioscape is an immersive environment that redefines the radio medium, establishing a new bodily relationship to the medium and adding a new layer to a region of a city. Fifteen custom developed radio transmitters are distributed over a part of a city. Each transmitter is transmitting one layer of a 'meta-composition'. The audience uses a custom developed receiver that is able to mix the (received) signals from the individual transmitters and receive multiple signals simultaneously. The participants explore and interact with the composition by navigating through the urban environment. By navigating the city the audience generates their own sonic order, combinations and timing of the composition. By interacting with the environment the visitors become 'inhabitants' of the organized transmitted signals. The visitors reorganize the area and assign new meanings to places. Mixing the signals of multiple transmitters Radio as we know it from the AM and FM band doesn't allow a receiver to receive two transmitters, each with its own frequency, simultaneously because the receiver is tuned to one frequency at a time. Inversely, when two FM or AM transmitters are transmitting on the same frequency the result is a distorted signal coming from the receiver instead of an addition of both (signals). 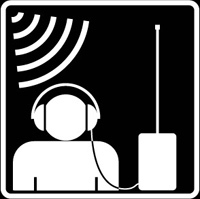 Radioscape is using a different modulation principle in the transmitters and a corresponding different demodulation principle in the receiver. This opens up the possibility to receive the signals from multiple transmitters that are transmitting on the same frequency simultaneously. The audible range of a transmitter differs from 50 to 200 meters. The transmitters are placed in such a way that you receive about 2 to 5 different signals simultaneously. We are used to the fact that the received loudness of a radio station doesn't change with a variation of the distance between the transmitter and the receiver. We do know however that the received electromagnetic energy increases when we get closer to the antenna of the transmitter. FM modulation is a principle where the loudness of the received signal is independent from the received electromagnetic energy. AM modulation is different and therefore AM receivers normally contain an automatic gain control unit in the demodulator that compensates for the loudness decrease (/ increase) caused by a decrease (/ increase) in electromagnetic energy. The demodulation principle used for Radioscape results in an independent loudness for each received signal that is directly related to the strength of the picked up electromagnetic field of its corresponding transmitter. The closer you get to a certain transmitter the louder that signal becomes, the further away you move from a transmitter the softer the signal becomes until it is too soft to be heard or masked by other signals that are being received. Since the receivers are simultaneously receiving the signals from multiple transmitters moving the receiver will lead to a new loudness balance between all the signals. Certain signals are becoming louder while other signals are fading out. The receiver is a hand held device with two antenna mounted on it. It's meant to be held with two hands, actively moved and reoriented continuously. The output of the receiver is connected to a stereo headphone. Each of the transmitters is transmitting a mono signal. The receiver is not only special because of its demodulation principle that is able to receive multiple transmitters simultaneously, but is also special because it is, what I call, a 'stereo panoramic receiver'. The receiver has two different antennas on it (a loop antenna and a vertical antenna). Each antenna has its own direction sensitivity pattern. By combining the signals from the antennas in two different ways it is possible to create an antenna principle that is similar to how a stereo microphone works, but for radio waves. Transmitters that are to the left of the antenna will be heard more on the left side of the headphone and transmitters to the right side of the antenna will be heard more on the ride side. Rotating and moving the receiver changes the stereo image directly. Each transmitter is transmitting its own layer of the meta-composition. Every layer is slowly changing over time and eventually repeating after 4-10 minutes. The changes of a layer are the slowest changes that you can experience in this environment. It's a result of not walking and not moving the receiver and just listening to the change of the received layers themselves. The next level of change is the interaction that occurs when you don't walk but just move the receiver. By doing so, you reorient yourself in the field of received signals and find new perspectives to the environment. The last level of change is simply happening by walking and therefor getting closer to certain transmitters while moving away from others. Certain transmitted signals will decrease or disappear while other signals will fade-in or become louder. While listening, you alternate your focus and the way of interacting. There are quite a few sources in a city environment that radiate noisy electromagnetic signals. These signals can come from neon lights, computer controlled street lights, security systems, etc. Since they don't have an antenna they don't reach far but unexpectedly 'popup' on certain places. Often these signals mix well with the electronic nature of the meta-composition. Just as sound (and light), radiowaves can be reflected by objects and surfaces. The original transmitted signal and its reflection can add up together or cancel each other out. This could lead to loudness interferences that influence the smooth loudness increases and decreases resulting from a change of distance between the transmitter and receiver. Wether radiowaves get refelected by a building or not depends on the size of the building and on the wavelength of the radiowaves. Wavelengths longer then a building generally don't get reflected. Frequencies in the FM band have wavelengths around 3 meters. These signals are reflecting over and over. For Radioscape it turned out that it is best to use a frequency just above the AM band with a wavelength of about 175 meters. At this wavelength buildings do not reflect the radiowaves but now and then start to behave as additional conductors for the radiowaves. Getting close to a building results in an additional perceivable aspect of the interaction. Although the used frequency is a low frequency the quality of the signal is comparable to the quality of the FM band instead of the AM band.